When I was in seminary, we would often talk about “thin places” – a phrase used by Irish priest John O’Donohue among others – to identify moments when the barrier between our earthly reality and the holy realm beyond seems to disintegrate. A thin place might be as simple as seeing the sun rise or as poignant as watching a child be born. A thin place is a moment where the boundary between yourself and God feels nonexistent, when the holy reaches out and touches you in a real way. At the OAC, it can sometimes be difficult to find thin places. It can be loud and chaotic. Sometimes our guests are angry and yell, albeit for warranted reasons. Sometimes our guests are so tired of the brokenness they feel. On the other hand, though, thin places are all around us at the OAC: a guest letting a stranger borrow his phone to call home, a whole line of able bodied individuals letting a lady in a wheelchair cut in line. 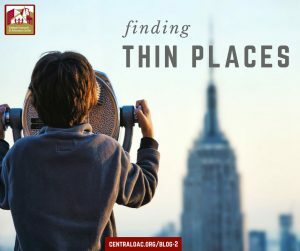 I want to share some of the thin places that I’ve been honored to bear witness to at the OAC, in the hopes that all of us will look for the thin places instead of the broken ones. Recently, I woke up in the morning with a pulled neck muscle. It was hard for me to turn my head side to side. I did stretches at my desk during the day to try to get some mobility back. I apologized to each guest I met with, so they wouldn’t think that I was purposefully not looking in their direction. One guest in particular, “Paul”, took an interest in my neck injury. “That happened to me a while back,” he said. “You gotta do your stretches. And get some Bengay to put on there. That’ll do the trick.” Again on his way out, he reminded me to get some Bengay to relieve my pain. About a week later, Paul joined our Main Frame program, and I saw him at the OAC one afternoon. “How’s your neck doing?” he called after me. I smiled. “It’s doing so much better, thank you for remembering!” I responded. With all that Paul had to worry about, he managed to remember my insignificant pulled muscle and wanted to know if I was doing okay. Whenever guests take the time to care for our staff and volunteers, I am always touched. Last week, I worked with “Mr. Peters.” Mr. Peters was the first guest I served that morning. I was tired and wasn’t feeling very energetic. I just wanted to do my job and get through the list of guests without too much fuss. Mr. Peters, however, wasn’t having it. First thing, he asked me how I was doing on a scale of 1 to 10. He told me he was an 8.5. I told him I was about a 7, and he said he was determined to get me to at least an 8 by the time he left. When I asked him why he wanted to get a Georgia ID, he told me he needed it to give blood. Each time I smiled during our interaction, he would say “Are you at an 8 now?”. On his way out, I asked him if he needed any toiletries or snacks. He told me he didn’t want to take any because he wanted to save them for the “people who really need them.” He was, however, very excited to share some salt water taffy with me. Despite his circumstances, Mr. Peters consistently found joy around him, even in some salt water taffy. What’s more, all he wanted was to use his abilities to make other people smile. After our meeting, he met with our representative from Social Security to apply for SSI benefits. It was clear to me that Mr. Peters didn’t have much going for him. Despite seeming like a nice grandfather, he didn’t seem to have any family that was supportive. But he made everyone he met feel like family. Despite not having any financial resources, he wanted to give what he did have – blood. Meeting with Mr. Peters forced me to check my own feelings at the door. I had come to work grumpy, but Mr. Peters had come to our center full of joy to share. Several months ago, I worked with “Jamal.” Jamal had nothing but the clothes on his back, and we were helping him get a Georgia ID. I gave him some of the donated clothes in one of our back rooms, and he was beyond grateful. On his way out, he asked if we had a comb. I told him that we didn’t. He wanted to comb out the braids in his hair to re-style it, but we didn’t have anything to offer him. He went on his way, and I didn’t think much of it. However, about an hour later, I walked through our lobby only to catch a glimpse of Jamal sitting on the ground with one of our female guests squatting behind him, combing out his hair for him and re-braiding it. This moment has stuck with me in an indescribable way. These two guests, arguably some of our loudest and, at times, challenging guests, were taking care of each other. Like two children at a sleepover, they were chatting and braiding hair as though they had nothing else to worry about. I watched them for a few minutes, sharing stories and relaxing in the courtyard. It touched my heart to see our guests caring for each other in such an intimate way. Our guests deal with more on a daily basis than many of us face in a lifetime. However, every day we see them reach outside of themselves and care for those around them. In circumstances where they have every reason to be selfish, they somehow find the strength to show compassion and kindness in often unexpected ways. In the midst of suffering, they recognize suffering in others. In the midst of trauma, they recognize the needs of others. There is great holiness in this, and also a wholeness: when we care for others, even when we are hurting, it helps us heal.